This art exhibition shall be a personal journey through the creative work of Angelo Casieri also known as Pazo Steel. His works are a triumph through steel sculpture. He uses his work in a truly unique way in which he brings together the use of his work to the urban setting. When Angelo brings his work to life in the urban settings it is exciting and shows how graffiti can be used in a modern approach. Angelo manipulates his brand name into architecture to make any shop gate or door way more attention grabbing. 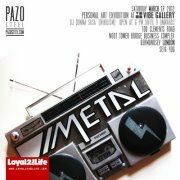 Pazo Steel creates designs for use of interior or exterior shops. His works include Ohm & Lotus, Laughing Buddha, and various metal relief works. This is an exhibition not to miss, with an insight into an up and coming Italian designer. With music by D.j Donna Sassa (Nihilism), and drinks from our open bar this St Patricks Day!